The first round of public hearings have taken place in Henderson, KY and Evansville, IN. There is wide support for the recommended corridor, keeping both existing bridges without tolls imposed. The next round of public hearings occur at the end of January. Join Project Team leaders to discuss the preferred alternatives for a new I-69 Ohio River Crossing. They want to hear what you think. Public comment period continues thru February 8. Comments can be made at public meetings, online at www.I69ohiorivercrossing.com, or email at info@I69ohiorivercrossing.com. Question, contact the project team at: (888) 515-9756 or info@I69ohiorivercrossing.com. 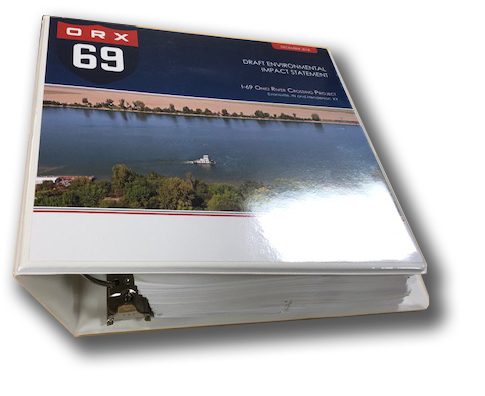 The Federal Highway Administration (FHWA), Indiana Department of Transportation (INDOT), and Kentucky Transportation Cabinet (KYTC) have completed the Draft Environmental Impact Statement (DEIS) for the I-69 Ohio River Crossing (ORX) project in the Evansville, IN and Henderson, KY area and have published its Notice of Availability for public comments in the Federal Register on December 14, 2018 (LINK). The DEIS is available for your review and comment on the project website at https://i69ohiorivercrossing.com/DEIS. Please submit your comments via the project email at info@i69ohiorivercrossing.com or to the project office listed below by February 8, 2019. The Board of Directors of BridgeLink commends the recommendation of Central Corridor 1 for the placement of a new I-69 bridge. This location is proven to be the best location for economic development, cross river mobility, ease of traffic congestion, and minimal negative local impacts. Central Alternative 1 includes a 4-lane I-69 bridge and retains the northbound US 41 bridge for local traffic. It includes new interchanges at US 41 (south end), US 60 and Veterans Memorial Parkway. BridgeLink will continue to advocate to keep both US41 spans open to traffic. The recommendation has two alternatives that the States could pursue: Central Alternative 1A includes tolls on both the new I-69 bridge and the US41 bridge, while Central Alternative 1B only tolls the new I-69 bridge. While the state DOT’s study indicates that tolling will likely be necessary to pay for the new I-69 bridge, the members of BridgeLink will work diligently to keep the US 41 bridges free for local traffic. 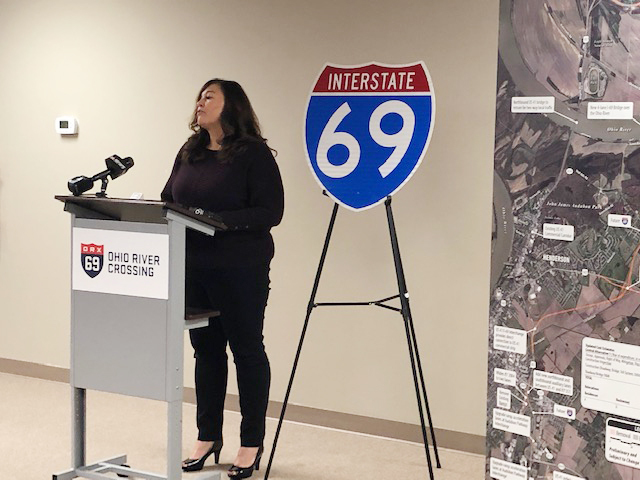 The states of Indiana and Kentucky have worked very hard to make the I-69 river crossing a reality, and the release of the Draft Environmental Impact Statement by our two state departments of transportation is a critical step required to move to construction of this important link. According to the joint Indiana-Kentucky studies of the need for the bridge, the location of the existing bridges is home to several high-crash locations. In addition, studies found that the existing infrastructure “strains to efficiently handle the cross-river volume of traffic”. With the construction of the new I-69 bridge, we will have relief from the safety issues and prevalent congestion found around the US41 bridges. With the approval of the Central Corridor 1 alignment, our communities will see the benefit of a new bridge without the cost of up to 306 homes and businesses displaced. Central Corridor 1 provides the best of all worlds for our area, and impacts will be seen immediately. Members of the public are invited to provide testimony in support of the route and the prompt construction of the I-69 Bridge. The Final Environmental Impact Study is expected to be completed in the fall of 2019, and construction could begin within several years after. BridgeLink is an advocacy group comprised of elected, civic and business leaders in Southwest Indiana and Western Kentucky who are committed to the construction of the I-69 Bridge between Evansville, Indiana and Henderson, Kentucky.